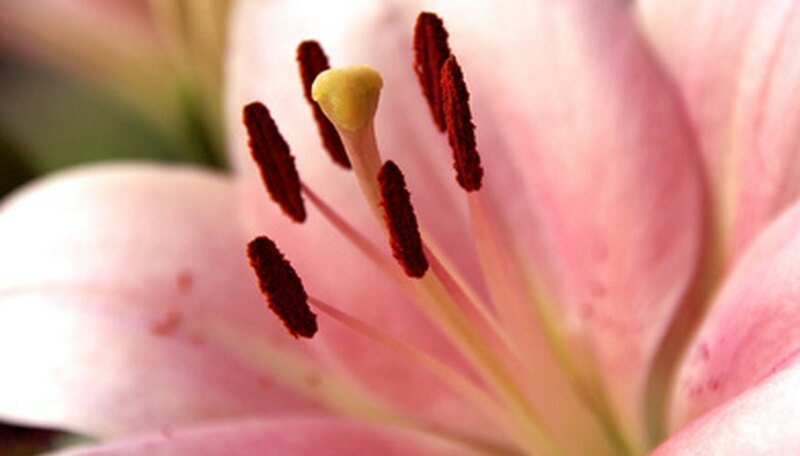 Anthers are rice grain-shaped organs found at the end or filament of a flower's stamen. They are the part of the flower which generates and releases pollen. Versatile anthers are those placed crosswise on their filaments, forming a T-shape. This makes the anther more able to withstand strong winds which would otherwise break it away as the filament twists. Consequently, those species of plants that have flowers with versatile anthers all rely on the wind to spread their pollen. Common shooting star, Dodecatheon meadia, is a flowering perennial that produces a single stout stem 1 to 2 feet tall, blooms from early to late spring dependent on the temperature. It can be cultivated in zones 4 through 10 provided it's placed in partial shade in moist, well-drained soil enriched with vermiculite or leaf mold. The blooms are an inch long with lengthy, cone-shaped yellow versatile anthers and white, lavender, or rose petals. Meadow saffron, Bulbocodium vernum, are spring-flowering bulbs similar in appearance to crocuses. They prefer well-draining, sandy soil, making them excellent accents for rock gardens in zones 5 through 10. Cold weather environments require they receive full sun, but warm and hot weather environments would do better to give them lightly dappled shade. Stalks are wide and fleshy, ranging between 4 and 6 inches long. Unlike most bulbs, the meadow saffron can have up to three blooms at a time, and should be dug up and redivided once every three years after the foliage has died. In early spring, the blooms will appear before the foliage. Each is trumpet-shaped, seven-petaled, folded back on itself to expose bright yellow versatile anthers over 2 inches in length. Marvel-of-Peru, Mirabilis jalapa, is a tropical annual with edible tuberous roots. The name "Mirabilis" means "miracle," and is pertinent because one marvel-of-Peru will produce blooms of different colors and patterns. These include white, yellow, red, pink and violet in mottled, solid, veined, striped or slashed patterns. This species is heavily branched with woody twigs that grows from 18 to 36 inches high in a conical, bushlike shape. The exterior is protected by tri-loped foliage 3 inches long by 2 inches at its widest point, which form a matted layer around the plant. Sitting atop this layer are the blooms, which have rough edges, five petals that are silky in texture and that open in the day and close at night. As before, each bloom has multiple protruding versatile anthers.